If you require a short-term solution to your concrete cutting needs, then you may wish to consider concrete saw rental. Increasingly, companies and individuals are opting to rent concrete saws which come in very handy when working with concrete, concrete fence posts or panels and so on. While some machines are versatile, there is no single, ultimate concrete cutting saw with a wide range to choose from in hire shops with Edco being a particularly popular brand. It is important that you know what you are looking for, as there are many different types of concrete saw, and each one is tailored for a particular purpose. One common type is the cut-off saw, a compact handheld machine which can make cuts of up to around 10 inches deep in one to two strokes. There are many of these available, and most are powered by either electricity, gas or hydraulics. A walk-behind saw offers a sturdier alternative which is easy to handle. Such concrete saws are ideal for pavement jobs. Automatic models can have a blade of up to 40 inches, but most man-powered models use blades of around 15 inches. Concrete chain saws are being used increasingly. The most powerful concrete chain saws can cut 25 inches deep. The gas models tend to cut between 10 and 16 inches. Concrete chain saws are slightly less easy to manipulate than the more conventional types, but because of their power and cutting depth, they are a tool to be reckoned with and necessary for some jobs working with concrete. 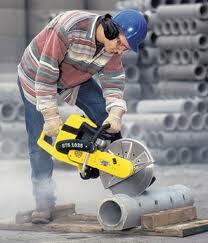 Core cut concrete saw rental is certainly an option worth considering. Such machines come in a variety of forms. Some are smaller, and very simple to operate, while others are more heavy-duty. It is always best to go for a machine which seems slightly above your needs than one which is of questionable use, because there is little room for error when it comes to cutting concrete. 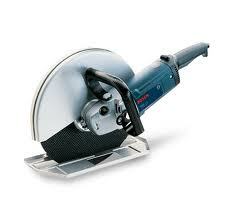 It is also worth looking at the brand name when you are looking to rent a con saw. Edco are amongst the most reputable. An American company, their machines are designed to be “rental tough” and they also tend to be versatile. Edco concrete saw rental is widespread, and it is rarely difficult to find a rental establishment offering their devices as they are a popular choice in the United States. Diamond blades are ideal for demolition work, and they exist on a range of machines. Note that most concrete cutting saw blades rely on water. That is, they cannot cut dry, and in addition, the water helps to lessen the quantity of concrete dust flying around as well as to keep the blade cool enough. This is not only desirable for the worker and the machine, but it also has the effect of cooling the wheel. It is important to always use the correct fuel with concrete saw rental. It also surely goes without saying that protective equipment must always be worn. When operating a concrete cutting saw machine, one must always be fully prepared, concentrating and aware because cutting concrete can be a hazardous job with obvious safety implications and you should certainly wear safety goggles and gloves. Thanks for sharing your informative article about concrete saw rental. I couldn’t agree more with what you said about how you can consider renting a concrete saw if you wish to use it as a short-term solution to your concrete cutting needs. My brother is experimenting in our garden. He’s trying to create a landscape design and needing a concrete saw. I will make sure to share your blog with him so he can check it for rental tips. I never knew that concrete chainsaws could cut 25 inches deep! That might come in handy considering that we need to remodel some concrete in our front yard. I’ll have to consider getting one of these saws so that we can cut quickly and efficiently.